Back in the autumn, Seasalt Cornwall came to the hotel to shoot some of their summer collection at The Old Quay House. We were lucky to have a dry, sunny day, so the photography could take place outside overlooking the estuary. We’re excited to be able to show you the results of the shoot. The new catalogue looks great, and is packed full of new designs, styles, and prints for the summer. 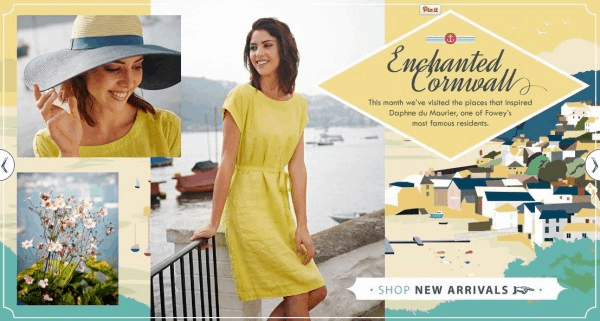 Those who know Fowey may be able to spot some of the locations in the background, including Readymoney Cove and the view across the estuary from Polruan, and we thought you might like to see a couple of shots of their model Emily showing off this season’s dresses on our waterside terrace. If you’d like to find out more or see Seasalt’s full summer collection visit one of their stores (there is one very close to us on Fore Street) or visit the Seasalt Cornwall website.